Saturday Night Live’s ratings success this season has sometimes felt like it’s come at the expense of the show’s able ensemble cast, as big name guest stars keep taking up airtime and getting all the morning-after press. Which, okay, is what’s happening here too, but last night’s lackluster Jimmy Fallon-hosted episode didn’t have all that much to recommend it as water cooler talk. (Or “whatever communal drink container people gather around on Easter Sunday” talk, as the case may be.) And any time four-time host and resident Sean Spicer Melissa McCarthy drops by to yell at everyone and lie like no one’s watching, it’s worth a second look. 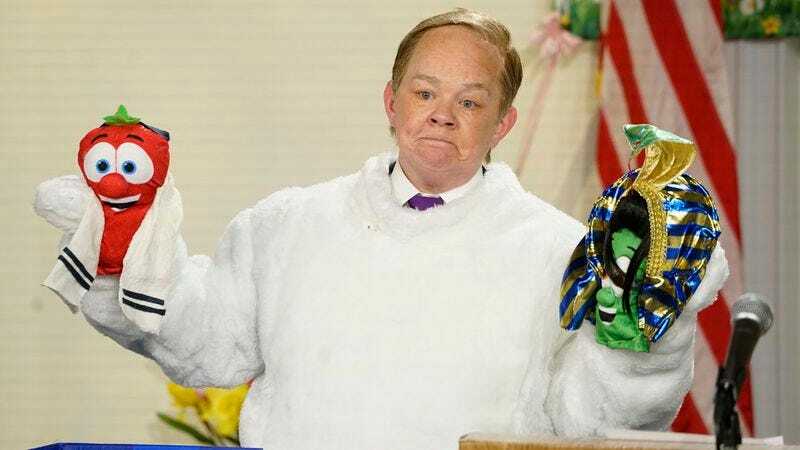 This time out, the visiting McCarthy emerged in Spicer’s erstwhile White House Easter Bunny garb and scared away the kids gathered for this year’s poorly planned egg hunt before launching into a typically belligerent half-apology/full-throated defense of Spicer’s recent whoopsie-daisy, where he tried to shore up the Trump administration’s missile attack on Syria by making one of those “even Hitler wasn’t as bad as X” analogies that always goes so well and never backfires, ever. Whipping out some inappropriately Christian Veggie Tales dolls to inexplicably rewrite the story of Passover while inadvertently doubling down on his faux pas, McCarthy’s Spicer only digs himself deeper into that hole where all those who glibly downplay the Holocaust invariably reside until they get unceremoniously fired. Pointing out the way in which the daily theater of the White House Press Secretary’s media meltdowns serve to distract from the Trump administration’s even more weighty and potentially calamitous meltdowns (Hi, North Korea! ), the bunny-suited eventually Spicer roars off in his souped-up, egg-shaped go-kart, smashing through the set while offhandedly telling us this is “probably our last Easter on Earth” anyway. Happy Easter, everybody!